While in Minneapolis, I had a good experience volunteering at a homeless shelter where I was mostly involved in working with kids from 5-year to 15-year-olds. Since I moved to Chicago, I hadn’t involved myself in the community much and was looking for places to volunteer. I had always been interested in psychology and counseling, and this position, while mainly being social work, sounded like it could be a good experience. The 40 hour required training prior to start was impressive, as well. What makes you come back each week? Every call is different, every situation is unique. The ability to be a resource to those in times of need is a great feeling. Apart from that, the call center atmosphere is so friendly and relaxed. There is never a dull moment. It is a great escape from my regular busy schedule. Not to forget, the staff goes far and beyond to keep the volunteers happy and keep coming back. What have you learned from your experiences at NRS? Just a few hours every week volunteering shows you first hand that so many average youth end up in crisis. How a little bit of time can help the callers explore their options, develop a plan and utilize external resources. Just asking the right questions and being an ear to them goes great ways. Do you have a story from the crisis services center that has stuck with you? A youth called us who was living with their single parent and four other siblings in a small one bedroom apartment, with not enough to eat and having to take care of their younger siblings. This was effecting them personally and also effecting their school work. They were so overwhelmed that they wanted to run away from home. By the end of the call, we were able to explore an option for the youth which they felt comfortable with and they choose to stay at home. Any other thoughts? I would like to give a big thank you to all the call center supervisors, the trainer, NRS’ staff and the fellow volunteers. for making NRS a great resource for youth in crisis and a great place to volunteer. 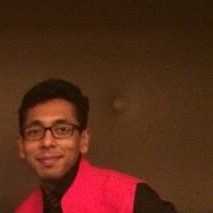 Congratulations again, Ankit, for being named our crisis services volunteer of the month! Be sure to check back in August for our next volunteer of the month!